July 25, 1554 was a monumental day for England's first queen regnant, Mary Tudor. On the feast of St. James at Winchester Cathedral, the English queen married her cousin Philip of Spain. At thirty-eight years of age, Queen Mary was no longer the radiant beauty of her youth. Her famously beautiful golden-red hair was now streaked with gray, while the first lines were beginning to mark her earnest face. Notwithstanding this, the queen was attired magnificently in 'rich apparel', including a golden robe and a gown of rich tissue embroidered upon purple satin (purple being the colour of royalty) set with pearls and lined with purple taffeta, and a kirtle of white satin embroidered with silver. Mary was accompanied by loyal members of the nobility. Her soon-to-be husband was also splendidly attired in gold. The earl of Derby carried the sword of state before her, while her train was borne by the marquess of Winchester. Notable attendees included the bishops of Winchester, London, Ely, Durham, Chichester and Lincoln. The wedding was attended by vast numbers of observers, who 'gave a great shout' of joy upon witnessing their sovereign's marriage. The queen's absence of close male relatives meant that she was given away by the marquess of Winchester and the earls of Derby, Bedford and Pembroke. Following a nuptial mass, Philip and Mary proceeded to the bishop's palace under the canopy of state. 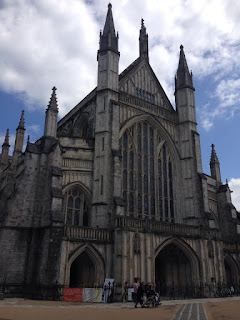 The couple spent several joyous days in Winchester following their summer wedding. They then departed for Windsor and then to London, in order for the capital's inhabitants to welcome their queen and new king. Several weeks later, it was confirmed that the queen was pregnant. This could rightly be viewed as the happiest period of Queen Mary's tumultuous life. Sadly for her, however, she did not prove to be with child, and her 'pregnancy' ended in humiliation in the late summer of 1555, when it was confirmed that the queen had instead suffered from 'long-standing menstrual problems and a great deal of wishful thinking' (Weikel). Although Mary had joyfully anticipated her wedding to Philip, it proved to be a volatile marriage that was marked by the queen's love and loyalty to her husband on her part and restlessness and exasperation on his part. It is questionable whether Philip ever loved his wife. Almost certainly ambition played a greater role in his decision to marry the queen of England. At her death in the winter of 1558, he remarked that he felt only minor regret. Their marriage was marked by frequent absences from one another, and tragically for both king and queen, their union was never to be blessed by the birth of an heir with which to inherit the crowns of England and Spain.